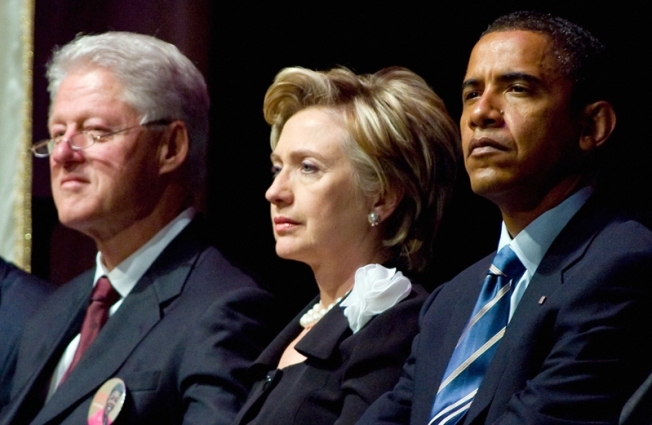 Bill Clinton with President-elect Obama and Hillary, Obama's new Secretary of State. Former President Bill Clinton says he is open to the possibility of a role in the Obama administration, but said he otherwise plans to be deferential to both the president and his wife, the Secretary of State. Clinton could be named as a sort of super-ambassador on a specific issue like India, or on a broad topic like restoring goodwill for the United States abroad. He was deferential to President George W. Bush, accepting assignments on hurricane and tsunami relief in conjunction with the president’s father. The former president told CNN international that he’s “just try to be a helpful sounding board” for Hillary Clinton when she becomes the nation’s chief diplomat. “Unless he asks me to do something specific, which I'm neither looking for nor closed to,” Clinton said. Clinton spoke in Hong Kong, where the William J. Clinton Foundation convened a Clinton Global Initiative Asia meeting with current and former heads of state from around the region. Friends say Clinton believes that every former president has a lifetime obligation to ever future president, and will continue to be very deferential. BILL CLINTON: “First of all I think that virtually everything I have agreed to do although it’s all over and above what the law requires is quite appropriate. For example if she is going to be secretary of state and I operate globally and I have people who contribute to these efforts globally I think that it’s important to make it totally transparent. Say who the donors are and let people know that there's no connection to the decisions made by America's national security team including the Secretary of State. So everything else that's part of this I have no problem with. I think it's a good idea. I think what the Obama transition team was concerned about is not that there's something wrong with having CGI in Asia or Latin America for that matter, but that if you have an event like this overseas and the sponsors are largely non-American they don't even want the appearance which I think is important, the appearance of this is important that someone is supporting this because they want to be viewed favorably by the Secretary of State and the White House. Q: How involved do you think you will get in the decisions that your wife will have to make as far as foreign policy? BILL CLINTON: Very little. I think my involvement will be what our involvement with each other’s work has always been which is all the years that I was Governor and President, I talk to her about everything. I found her advice invaluable and I'm sure we'll talk about all this I mean I really care about all these profound challenges that our country and the world are facing. But the decisions will have to be ultimately the President-elect Obama's decisions to make about what we are going to do, what our policies are going to be and she will be part of the team formulating those policies and carrying them out. I'll just try to be a helpful sounding board to her but I don't think I'll do anymore than that. Unless he asks me to do something specific which I'm neither looking for nor closed to. BILL CLINTON: I must say she didn't do it with any thought of becoming secretary of state. I think she was shocked, she first read about it in the newspaper speculation … And I think it was a very wise decision by the president elect and I think she made the right decision but for her it was hard she adored being in the senate…. BILL CLINTON: I don't think we can turn it around in less than a year because too much wealth has already disappeared. The stock market might come back in less than a year but the shrinkage … it’s already occurred in investment wealth is going to play itself out in the real economy. I don't think it will take longer than three years. So I would say if they make really, really good decisions, which I think they will, probably somewhere between 15 months and two years we will back up again.